I am honoured to announce work from my recent project 'Skene' has been acquired by the UK Government Art Collection. Works of art from the Government Art Collection (GAC) are displayed in UK Government buildings in nearly every capital city, making it the most dispersed collection of British art in the world. The role of the Collection is to promote British art while contributing to cultural diplomacy. Dating from 1898, the Collection has expanded over the years and now contains over 13,500 works of art from the 16th century to the present day by mainly British artists in a broad range of media. For more info please visit the UK Government Art Collection website. 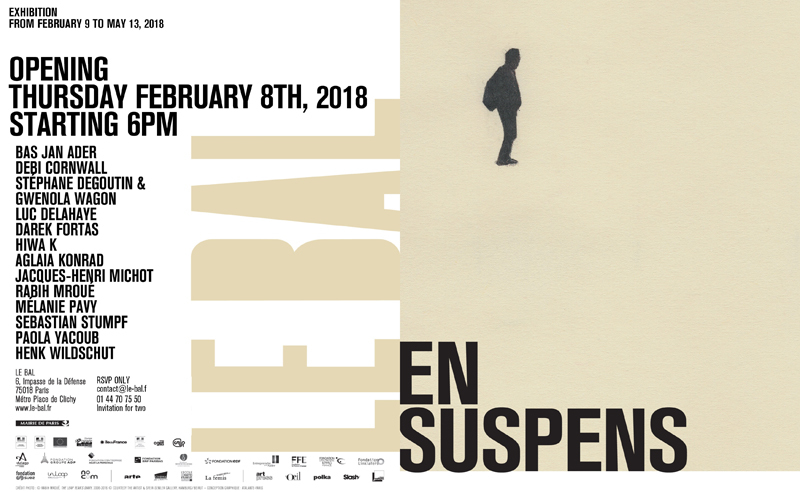 You are cordially invited to 'EN SUSPENS' group exhibition at LE BAL, Paris opening on Thursday 8th February @ 6pm. Very honored to have my photographs exhibited among some very stimulating still and moving image work by Bas Jan Ader, Debi Cornwall, Stephane Degoutin & Gwenola Wagon, Luc Delahaye, Hiwa K, Aglaia Konrad, Jacques-Henri Michot, Rabih Mroué, Melanie Pavy, Sebastian Stumpf, Henk Wildschut and Paola Yacoub. LE BAL and Shelter Press co-edited exhibition catalogue which will be available from 8th Feb.
"EN SUSPENS" is running until 13th May. "Between Factual and Fictitious Aspects of Lens Based Practice" - the interview between myself and Marek Wolynski (curator of Belgium based Verbeke Foundation) has just been published online. Contemporary Lynx is an arts organisation and print magazine launched in January 2013 to encourage an appreciation and understanding of Polish contemporary art by a wide audience. The main goal of the organisation and magazine is to raise awareness of Polish artists’ contribution to the international art scene. Contemporary Lynx is a springboard for further activities happening beyond the Internet – curatorial projects, art exhibitions, international cultural exchange, research and cross-media art events. I am thrilled to announce I am one of the selected artist for Bloomberg New Contemporaries 2017. The panel of guest selectors comprising Caroline Achaintre, Elizabeth Price and George Shaw has chosen 47 artists for the annual open submission exhibition. For the first time the national touring exhibition will launch at BALTIC Centre for Contemporary Art, Gateshead and BALTIC’s project space at BALTIC 39, Newcastle upon Tyne from 29 September to 26 November 2017. The exhibition will then travel to Block 336, London, from 27 January to 3 March 2018. For more information, visit Bloomberg New Contemporaries website. I have been invited to deliver a lecture titled "On Becoming: A Study of Human Perception and Photography" as a part of 'Skene' solo show at RUA RED. The lecture will take place on Tuesday, 11th October 2016 at 4pm. All are very welcome, if interested in attending please RSVP at info@ruared.ie. Massive thanks to Artful Dodgers Imaging and staff at RUA RED for their hard work and generosity. I have been awarded Royal College of Art & Artful Dodgers Graduate Award for my project 'Skene'. The award will allow me to develop 'Skene' and produce large scale handmade C-type colour prints for the upcoming solo exhibition at RUA RED Gallery in Dublin. Artful Dodgers is industry leader when it comes to C-41 processing, colour handmade printing and retouching services. Their list of clients include: David Bailey, Julian Broad, Steve Harries, Rut Blees Luxemburg, Nadav Kander, Emma Hardy, Liane Lang, David Chancellor & Joel Sternfeld. I am delighted to announce I have been awarded the Travel and Training Bursary awarded by the Irish Arts Council. The award will contribute to realisation of new body of work which will be showcased in a solo show at RUA RED in Dublin in September 2016. I have been invited to take part in Les Gueules Noires de l’Europe – project organized by Lille based NGO Histoire de Savoir(s). Established in 2009, Histoire de Savoir(s) is Non Governmental Organization which aims encourage active citizenship and non-formal education of EU citizens through engagement with visual arts. The project will consist of group exhibition of photographic works at 9-9 Bis in Oignies as well as delivering series of workshops. The group exhibition will feature photographic works exploring mining communities in Northern France as well as in Upper Silesia, Poland. The project is generously supported by the European Commission’s Youth in Action programme. I am taking part in a group exhibition ‘Focal Point’ at UNIT24 Gallery curated by Marek Wolynski which features his latest body of work ‘At Source’ (2013) along the work of Kenji Hirasawa, Christopher Oliver and Joanna Sperryn-Jones. The exhibition will open on Thursday Thursday, 12 March 2015, from 7-9pm.’Focal Point’ will run until 10th April 2015. I would like to thank Polish Cultural Institute in London for the support. On 20th November 2014 at the Eugene Delacroix National Museum in Paris Joséphine de Bodinat – director of Fondation Grésigny – announced I am the recipient of the Camera Clara Prize 2014. I would like to thank all the jury members: Joséphine de Bodinat, Audrey Bazin, Elger Esser, Frédérique Babin, Diane Dufour, Ute Kohlmann, Chantal Nedjib, William Piens, Michel Poivert and Fabien Simode. Also, massive thanks to Fondation Grésigny, Institute Polonais Paris and Central Dupon Images Paris. One of my recent body of work 'At Source' has been shortlisted for MAC International 2014 Art Prize. The MAC has launched its new international art prize, offering professional artists worldwide the opportunity to exhibit at the MAC with a substantial prize of £20,000 awarded to the winner – one of the biggest contemporary art prizes in Ireland and one of the few major prizes in the UK. The exhibition, which will run across all three MAC galleries from 31st October 2014 until 18 January 2015, aims to offer visitors the very best in contemporary visual art including sculpture, painting, photography, film, installation and performance. The winner of the £20,000 prize will be announced at the opening ceremony on 30 October, 2014. MAC International will build on the innovative visual art practice built up by the MAC and will offer a similar experience to the Turner Prize in Derry-Londonderry as part of 2013’s City of Culture. For more information, please visit official website of MAC International 2014. One of my photographic work “Still Life II (Piece of Soil)”, from the series “At Source” (2013) and video performance piece “Recurrence of Resistance” (2014) and will be part of group exhibition “Expansive Traces” at the Ormston House in Limerick curated by Eimear Redmond. Other artist in the show are Laura Kelly, Shane Murphy, Emma Roche and Susan Lynch. The exhibition focuses on the versatile and temporal nature of drawing and mark-making. Using a dynamic range of tools and materials, the exhibition contemplates the act of recording, documenting, discovery and erasure as processes in each of the artists’ works. Through a variety of media, the gallery becomes spatially adapted by site-specific installations, which temporarily transform the walls into drawing grounds. Despite distinct conceptual concerns, a common thread runs throughout – the compulsion to make a mark, physically creating and expressing explorations of subject through line. The exhibition is kindly supported by The Arts Council Visual Art Project Award & Limerick City of Culture. ‘Portrait I (Miner After Work)’ and ‘Interior I (Miners’ Changing Room)’ will be part of 184th Annual Exhibition at the Royal Hibernian Academy. The exhibition is running from May 26th until August 17th, 2014. ‘Coal Story’ will be exhibited as a part of ‘Lockout and Labour’ exhibition at Limerick City Gallery of Art. ‘Labour and Lockout’ curated by Helen Carey is a keynote exhibition to mark the forthcoming centenary of the 1913 Dublin Lockout. Participating artist: Darek Fortas, Anthony Haughey, Mark Curran, Jesse Jones, Megs Morley & Tom Flanagan, Seamus Farrell, Deirdre Power, Sean Lynch, Deirdre O’Mahony. I am delighted to announce i am recipient of Arts Council’s Visual Art Project Award for 2013. This generous support will contribute to development of brand new body of work under the working title “At Source”. I have been invited to be one of the Jury Member (Visual Arts) for Neu/Now Festival 2013 (project by ELIA – European League of Institutes of the Arts European Commission DG Education and Culture). 'Coal Story' will be exhibited as a part of FORMAT13 Photo Festival in Derby, UK. FORMAT was stablished in 2004 by Louise Clements and Mike Brown, the biennale festival celebrates the wealth of contemporary practice in international photography and is now one of the UK’s leading international contemporary festivals of photography and related media. Darek would like to acknowledge very generous financial support of Culture Ireland’s International Culture Programme grant that will make the installation of ‘Coal Story’ at FORMAT Photography Festival possible. Pictures from my recent project 'Coal Story' will be published in ‘Uncertain States’ – London based quarterly newspaper that attempts to expand a critical dialogue and promote visual imagery. “In a time where the proliferation of imagery is rendering itself insignificant and meaningless, the artists in Uncertain States are concerned with the intention of the work. All the work published is made to be viewed with consideration and concerned with the meaning and reading of the photograph”.